As well as simple editing operations (such as creating a new record, or changing an existing one), there are many useful things that can be done with lists. For certain files it is possible to add up particular fields in the highlighted records and display the total on the screen. This is done using the Sum Selection command. The highlighted records are summed and the result is displayed. Tip: On the Mac, if you hold down the option key, the Close button will change to Keep, enabling you to keep this sum around and do another. You can colour individual or groups of records in the transactions, names, products, jobs and job sheet items files. All the highlighted records will be changed to the specified colour. 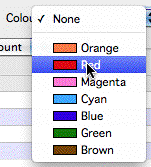 You can also set a record’s colour as you enter or modify it by setting the colour pop-up menu on the entry screen. Note: Individual tables in MoneyWorks can have their own colour labels. These are set on the Fields tab of the Document Preferences.